Table: Summary of the described families. Spring snails are a very diverse family of small to tiny snails inhabiting fresh or brackish water, also appearing on humid ground near the coast. Very few species also actually are found in the sea, on muddy ground among seaweed. It is estimated there are about 300 species in North and South Europe, about 1000 species worldwide, in Australia alone 280 species are mentioned. 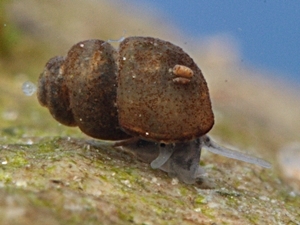 In Central Europe many spring snail species inhabiting ground water, caves or springs are limited to one single geographic finding site, which means a very large ecological threat to those species. Systematics of Gastropoda: Clade Caenogastropoda: Amnicolidae. In Central and South Europe about 40 species of spring snails are found, of which the five most important German species are defined mainly by anatomic characters, but are difficult to tell apart by shell characters. Often, the single species can only be told apart by the finding location, as they are restricted to a very narrow area. This does lose importance in a growing fashion, as for example in Austria there are often several species of spring snails in one place usually restricted to a narrow finding area. 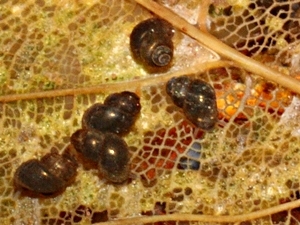 The colour of spring snail shells often appears dark brown or green. This is due to diatoms (brown) and green algae growing on the shell surface. Distribution of spring snail species often happens by insects capable of flying, on which the snails have laid eggs. Spring snails live on diatoms, blue and green algae which they graze from the ground, as well as on detritus - decaying organic matter. 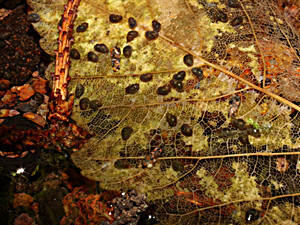 Spring snails (Bythinella compressa) on a fallen leaf. Accustomed to constantly low water temperatures, spring snails are cold-stenothermal creatures. They almost exclusively live on springs and in the uppermost areas of streams. The presence of spring snails is an indicator for very clean water; in the springs of clean streams sometimes more than 1000 snails can be found per square metre. Spring snails are crenobionts, which means the are specialist with a very low ecological amplitude, which react to the slightest difference in environmental conditions, their density decreasing or the population disappearing altogether. On the other hand, spring snails are very well adapted to the extreme habitat of springs. Spring snails are usually threatened by fountain constructions around the springs they live in, by agricultural use as watering place for cattle. Also drainage and ground water descent are a large problem to spring snails, and sadly so is overfertilisation, resulting in the Eutrophication also of springs. Additionally, global warming results in the water temperatures of springs rising, which means, the cold-stenothermous populations of spring snails generally decrease. Limestone tuff spring near Fischbach in the Rhön mountains. 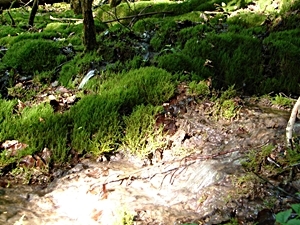 Habitat of the Rhön spring snail (Bythinella compressa). 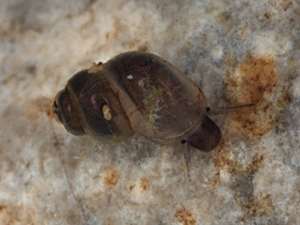 Description: The Austrian spring snail is smaller than Bythinella bavarica (see below) and almost cylindrical. The whorls of its shell are flattened at the sides. Also the suture is less prominent. The last whorl takes two fifths of the shell's overall height. Dimensions: H: 3.2 mm; W: 1.6 mm. (Abbreviations). biidae). Picture: © Alexander Mrkvicka, Vienna. Distribution: The species is an main indicator species for springs and low mountain streams. It is found in the eastern Bavarian limestone Alps and the Sudetes, through Moravia, Austria as far as north-eastern Tyrol, Styria, Carinthia, Northern Slovenia, Hungary and Galicia. Threat Situation: In Austria the Austrian spring snail is classified as "Near Threatened" (NT) (see also: IUCN Threat Categories). The shell is less slender, the suture noticeably deepened. The whorls are rounded at the sides, the last whorl takes two thirds of the overall shell height. Dimensions: H: 2.6 - 2.8 mm; W: 1.5 - 1.7 mm. (Abbreviations). Distribution: Northern Alps, eastern Bavarian limestone Alps and their foot hills. From Munich east through Bavaria, as far as northern Tyrol and Salzburg country, Pottenstein near Wiener Neustadt (Lower Austria) and the high terrace near Munich. According to Reischütz Bythinella cylindrica is to be seen as a subspecies of Bythinella austriaca. Rhön spring snail (Bythinella compressa). The Rhön spring snail's shell is oval to bluntly conical, the last whorl takes four fifths of the shell height. The whorls are strongly rounded at the sides, the apex is blunted a little obliquely. Dimensions: H: 2.2 mm; W: 1.5 mm. (Abbreviations). Distribution: In Germany: Rhön and Vogelsberg mountains in Hesse and Thuringia. Also present in Austria. The Rhön spring snail needs constantly cold and unpolluted water (saprobial value of 1.0) with a temperature of around 7 - 8 °C. It feeds on bacteria growing on stones and leaves, as well as on decaying organic matter (detritus), which is grazed from stones, water plants, fallen leaves (picture) and dead wood lying in the water. Rhön spring snails (Bythinella compressa) on a fallen leaf. While some time ago the Rhön spring snail was wide spread in the open landscape shaped by man, today it appears nearly exclusively in spring exits and some hundreds of metres downstream in the streams of deciduous forest areas. In intact habitats there may be as many as 50 snails on 25 x 25 cm. Populations live isolated from each other. With their highly specialized demands to habitats (see above), populations disappeared are lost forever. Description: The Bavarian spring snail usually is large (for a spring snail), turricular and conical with rounded whorls, the last of which is widened. The shell often is green coloured due to algae growing on it. The shell tip (apex) is small and blunted obliquely, the whorls are separated by a deep suture. Dimensions: H: 4 mm; W: 2.3 mm; N: 4½ - 5. (Abbreviations). Distribution: The Bavarian spring snail is a calciphile species - it needs limestone ground. Its distribution area spreads over the northern Alps and the foot hills (Lech and Isar river areas). The Bavarian spring snail can be found from southern Württemberg as far east as the Inn river and northern Tyrol in Austria. Geyer, D.: Unsere Land- und Süßwassermollusken, Stuttgart, 1927, S. 165 ff. Wolfgang Fischer: Checklist of Austrian Mollusca. 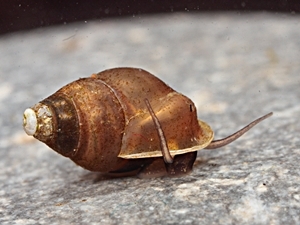 Wide-lipped spring snail (Emmericia patula). Description: The wide-lipped spring snail has a bluntly conical shell, the last whorl of which has a distinctive palatal callus. The apertural lip, as the name states, is folded back to form a wide whitish lip. The whorls grow fast. Dimensions: H: 6 mm; W: 4 mm. N: 4½ - 5. (Abbreviations). 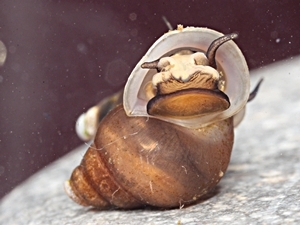 Habitat and Distribution: Emmericia patula lives in springs and rivers rich in limestone. The species' distribution area spreads along the Italian and Yugoslavian Adriatic coast from Venetia as far south as Central Dalmatia. In southern France and Bavaria (Central Franconia), Emmericia patula has been introduced in 1960; how and where from, is unknown. In the meantime, it has also been found in Dachau and Munich. Wide lipped spring snail (Emmericia patula) from the Tinavo springs near Trieste, Italy. Francisco Welter-Schultes: Emmericia patula species homepage. Dr. Stefan Nehring: Neozoa (Makrozoobenthos) in den deutschen Gewässern - Eine Einführung. (In German). 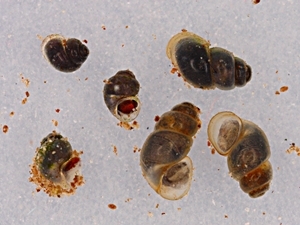 Molluscs With Immigration Background (Neobiota).